Enjoy the canals of Ghent and the stunning architecture of Antwerp before riding into Flanders. Cycle through fields of poppies, visit medieval towns and enjoy contrast between the historic with the new, from countless castles to art museums. Our cycle holidays take you down canal cycle paths and quiet forests allowing you to immerse yourself in the rich history and culture of the country. Build up an appetite each day and sate yourself with a crisp and frothy Belgian beer over a plate of frites and moules. The beautiful city of Antwerp. One of the picturesque stops on your Belgium cycling holiday. A group of cyclists riding from Holland to Belgium. A common and scenic route. Rural country roads are in abundance in Belgium. All levels of riders can enjoy this holiday destination. Meadow with cherry blossoms in springtime in Flanders, Belgium. Our most popular Belgium cycling holidays are with families. We offer various trips that guide riders through multiple countries including France, Germany, Holland and more. Belgium is the perfect place for family cycling holidays as the flat routes that we recommend ensure the riding is comfortable and scenic throughout. You’ll find that there is something for everyone along these routes with stunning architecture making up the famous cities, vibrant countryside in the outskirts and plenty of activities to keep the children (and adults) entertained! Our Amsterdam to Bruges Cycling Holiday is a particular favourite. 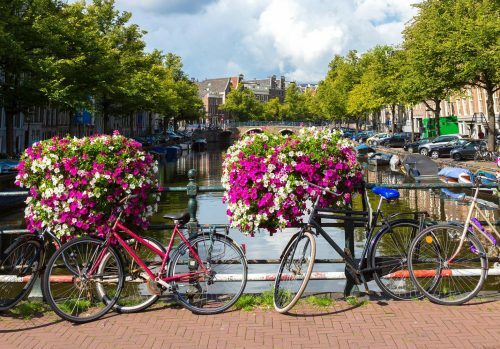 The 8 day holiday guides you from the cycling city of Amsterdam down the west coast of Europe, through Gouda, Willemstad, Vlissingen, other picturesque dutch and Belgian towns, and finally into Bruges. Each day you will ride an average of 50km per day however, this can be adjusted to fir the requirements of you and your family. You will enjoy the contrast between lively towns and peaceful countrysides. It is a perfect trip to introduce you to the best Holland and Belgium have to offer. Our cycling experiences in Belgium are all designed to give you the best, most unique experience at the lowest price possible. Our contacts and partners in Belgium ensure that we can offer you the best deals in the country whilst being guaranteed of an exceptional trip in Europe. The itineraries on our website offer you a rough guide as to the trip that you can take through Belgium however, we love talking to you and finding out what it is that will make your trip perfect for you. Whether this is involves shortening the holiday, changing the accommodation or spending longer in certain places, we can easily do this for you, just let us know. With this in mind, we highly recommend our Cycling Holiday Across Five Countries. This trip is perfect for true explorers and people who want to experience as much as possible in the time they have available. You'll visit Holland, Belgium, Luxembourg, Germany and France over the 10 days, ensuring you enjoy an action packed holiday off the beaten track and away from the typical tourist spots of each of these countries. It's a great trip for friends and families looking to spend quality time together on a low pried cycling holiday. Groups of friends will enjoy brilliant riding conditions in Belgium. As a feature on our country to country holidays, Belgium provides groups with beautiful scenery and traditional towns. Due to the flexibility of our trips, we are able to adapt the itinerary to suit the unique needs of you and your friends. So, if some of you would like to spend shorter days on the bike and more time exploring the cities whilst others ride further, this is not a problem and we’d be happy to tailor the trip to your specifications. The smooth, flat country roads provide you with relaxed riding conditions. For less experienced groups of friends, these conditions give you the chance to chat with friends along the way and take in the beautiful surroundings. We would recommend our Amsterdam to Paris Cycling Holiday as the best for riding with friends. On this 11 day trip you’ll visit the famous cities of Amsterdam, Brugges, Gouda and Paris, and be treated to the scenic European landscape that connects the incredible cities and towns. On day 7 of our Amsterdam to Bruges Cycling Holiday you will arrive into the Belgian city through rolling vibrant countryside, quiet country roads and scattered villages. Also known as the peal of Flanders, Bruges is a picturesque city made up of colourful buildings and intertwining canals. Its medieval architecture and rich, traditional history makes it a city you will never want to leave. As such, we recommend staying here for a few nights. As it is the final destination on this trip, we can set you up in one of our favourite hotels in the city for as long s you wish. if you'd prefer to continue cycling, however, we recommend extending this trip to our Amsterdam to Paris Cycling Holiday. This holiday also runs through Bruges, allowing you to fully explore the city, however you will also visit various traditional French towns once you cross the border. 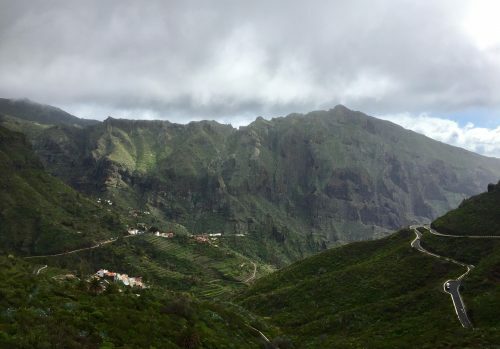 You can extend or shorten your stay in any of these destinations, just let our cycling experience team know how you want to go about your holiday when you enquire. Unanimously, Ghent is the most beautiful city in Belgium. Tourists and locals all share a similar passion for the city. Its beautiful canals and waterside houses combined with the mix of locality and the slight tourist buzz create a truly unique city environment. Ghent hosts an abundance of fascinating museums whilst also offering high-spirited bars and a dynamic evening culture. There is something for everyone in Ghent and, as a result, we feel that this Belgian city offers all tourists an incredible selfie opportunity whether that be in front of the beautiful canals, in one of the many museums or amongst the local, traditional food markets. We love cycling in Ghent and hope that you enjoy the experience just as much as us! You can visit this incredible city on our Amsterdam to Paris Cycling Holiday. Why Travel to Belgium with Love Velo? Belgium is undoubtedly growing in popularity as a cycling destination. As such, we are looking to provide you with cycling holidays that explore the country's highlights including the serene polders and lakes, the iconic, charming cities and everything in between. On our country to country holidays, Belgium often features as one of the highlights due to the country's natural beauty and the traditions and cultures that withstand the growth of tourism in the cities. By travelling with us, you can be confident that we will set you up in the best accommodation, provide you with the best routes and bikes, organise your transfers and more. We have plenty of experience in sending riders to the stunning country and would love to add to that list by organising a Belgium cycling holiday for you. As British Cycling's official travel partner, we can also offer a 10% discount o all our holidays to members of BC. Another benefit to booking with us that will save you money. For a low cost and high quality trip, we are the best cycling travel supplier available. Give us a call on 0207 157 1519 today or email info@lovevelo.co.uk and start planning your next trip!